Warmed up and ready to use in less than 2 minutes. Laminate photos, artwork, certificates and documents up to 12" wide. Quick laminating speed of 19" per minute. Laminate 10 letter size documents in just 7 minutes from start-up. Jam Alert automatically stops the laminating process Power Off conserves energy. Warmed up and ready to use in less than 2 minutes! Laminate photos, artwork, certificates and documents up to 12" wide. Quick laminating speed of 19" per minute. Laminate 10 letter size documents in just 7 minutes from start-up. 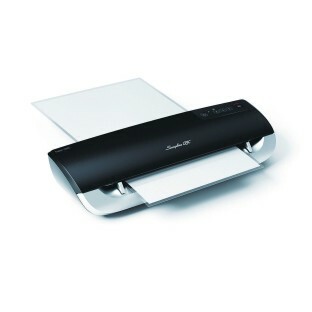 Jam Alert automatically stops the laminating process Power Off conserves energy. Ideal for groups. Laminating protects documents and gives a clear finish that looks better on display. Simply insert your document into a 3 mil or 5 mil laminating pouch. Even heat sensitive materials or photos can be safely laminated using the "cold setting."